VirtualDJ is the hottest AUDIO and VIDEO mixing software. It's a groundbreaking music creation and production application. Award-winning DJ software that gives you the #1 technique. Compact version of Steinberg's famed music production system. djay gives instant access to your existing tracks and playlists from iTunes. 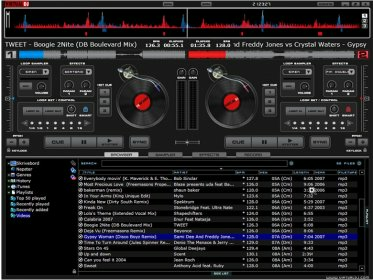 Open source DJ application for Mac, Linux and Windows. Helps you record your favorite radio broadcasts or audio conferences with ease. TRAKTOR KONTROL S2 is the 2-deck, all-in-one DJ controller system. Complete professional recording studio for the Mac. It turns your NI device into a versatile and efficient MIDI remote control. It's the most affordable point of entry into the incomparable world of Melodyne. Professional music production tool for Mac computers. Create amazing symphonic master pieces. Handy application for handling musical tempos. A utility for composing music, offering sounds, effects, modulating options. Creative toolkit for deep sound exploration. Peak Pro offers more creative potential than ever before. Now Bass, Cello, and Violin sounds are right at your fingertips. Tweak your tone with full control of Bass, Mid, Treble, Drive, and Compression. It is loaded with dozens of pre-recorded drum patterns. SI-Electric Piano has the ability to quickly dial-in classic tones. GUITAR RIG 4 PRO is the guitar and bass solution for perfect custom tone. Finale NotePad is your introduction to the world of music notation software. The world’s most popular, most advanced music and audio production platform. Compose. Arrange. Teach. Share. Unleash your potential with Finale.